Ok, I've been setting up registry keys for alot of custom applications and other things, and ofcourse, creating scripts to push them out. I just recently realized there is a more nice way of pushing this settings out and having some good wording and order of them, and that is, through Administrative templates in Group Policy. For a general overlook on how to do it, here is an example obtained from the Microsoft website, and some other good references I've found in the way. Remember, if it is not in the policies key folders for microsoft, it treats them as NT4 templates… in other words, you will have to tweak your Group Policy viewer in the filters section in order for them to be diplayed. Have fun!! 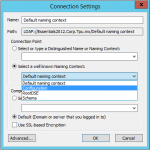 ; by using the variable "policyname"
explaintext="This policy disables the autoplay feature on the selected drive(s)"
then click Active Directory Users and Computers. New Group Policy Object box, and then press ENTER. Example.adm, and then click Open. the Show Policies Only menu item. What are the differences between databinding expressions: Eval and Bind?